It’s the yellow that catches my eye. Bright egg-yolk splotched with black warts, glistening against wet tarmac. Long, striped toes. A forearm flung out, fingers drooping, thumb hanging down, elegant as a lady offering her hand for a kiss. 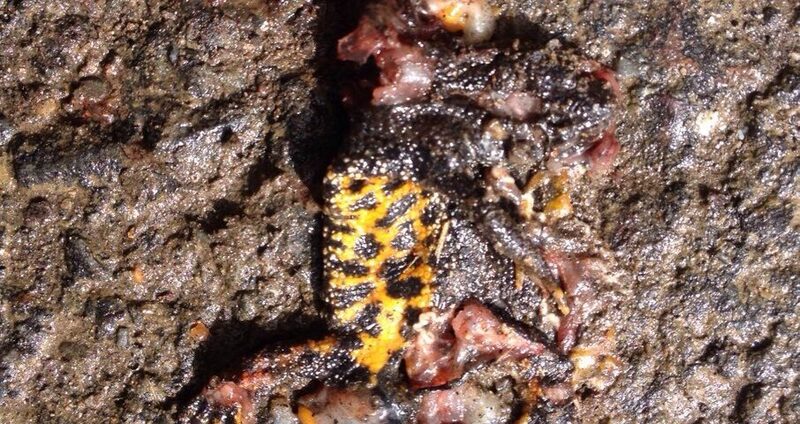 A great crested newt, Triturus cristatus, squashed. The pattern of pulping suggests a big, ridged tyre, probably a tractor. The driver would never have seen it in the dark, perched up high on his plastic seat, roaring up the lane to feed the heifers, one last job before turning in. Newts are largely nocturnal. They spend the winter semi-dormant, lurking under stones, compost heaps or buried in the mud. In spring they emerge to mate. Some will return to the same places as last year, while others trek a little further in search of new breeding grounds. They prefer a mild, rainy night, preferably moonless. Great crested newts, ‘askers’, used to be common in the Marshwood Vale. Damp meadows with abundant ponds provided an ideal habitat. Modern farming has more than halved the number of pools and the newt population has dwindled. Habitat loss is the main factor in their decline, despite their protected status. Last spring, a herpetologist surveyed all the remaining Vale ponds. He was looking for newt eggs. Great crested females each lay more than 200 individual eggs. They stick them one at a time on leaves, folding the foliage over for protection. The greeny-white, globular eggs are nearly twice the size of the greige ova of smooth and palmate newts. Females may deposit several eggs in turn on a single long blade, pleating it into an erratic concertina. I watched in hope as Philip checked our pond. More than ten years ago he found great crested newt eggs here. On his last couple of surveys, he found none. This visit would decide whether the site would be declared abandoned. The dead newt in the lane near our house was the only great crested I have seen. I could barely make out the silver line running down the centre of the tail – a male. He’d been travelling east, towards our pond. This is a Guardian Country Diary piece, published on 21 April 2018. See the piece online here.